Offering luxury lumber since 1798. The J. Gibson McIlvain Company has provided exemplary customer service and quality lumber products for over 210 years. We believe that customer satisfaction is directly correlated with a hands-on approach. Because of this, our expert representatives travel to forests all over the world to find the finest lumber for our customers. 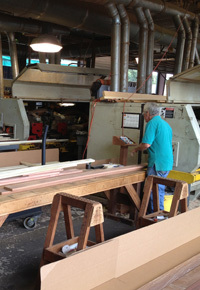 While in the field, our representatives examine the Sapele lumber and hand select only the best. But our hands-on approach doesn’t stop there. 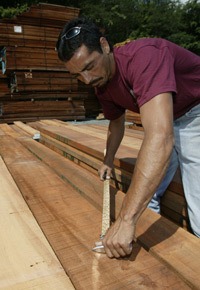 As each piece of Sapele lumber passes through our facility, it is constantly undergoing critical hand inspections. From the first inspection when the lumber enters the facility to the second after it is kiln dried, to the final inspection before it is prepared for shipment, each piece of lumber must pass our rigorous quality standards or it simply won’t be sold. Our powerful system of personal inspections guarantees that only the finest, premium quality lumber is used to fulfill our customers’ orders. As a McIlvain customer, you will have your own personal representative available to offer sales guidance, invaluable lumber information, and advice for your next project. During the initial order, that sales representative will dedicate their undivided attention to your project. They will listen and learn about the project specifications, requirements, deadlines, and, most importantly, the small details. In fact, your representative becomes more like your partner rather than just a supplier. After placing the order, our state of the art computer tracking system will follow your Sapele lumber as it travels through the various stages of our plant. Should you have any questions or concerns, your McIlvain representative will be available. Prior to the delivery date, you will receive a call from us to ensure that you receive an on time delivery. As the customer, you are entitled to know where your order is in our facility. Our computer tracking system allows us to provide you with such information. Because we take a genuine interest in our customer’s projects and directly correlate our business’ success with their success, we strive to go above and beyond our customers’ expectations. 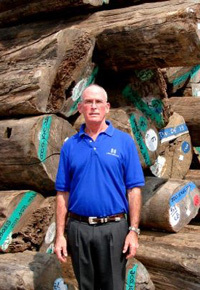 Through our hand selection of Sapele lumber from the world’s best forests, coupled with regular inspections during processing and our commitment to outstanding customer service, the J. Gibson McIlvain Company strives to provide each customer with only the best in everything. Trust us with your next exotic lumber, domestic hardwoods, plywood, or moulding project.